To be considered carnivorous, a plant has to fit three criteria: actively attract and kill its prey, have developed a mechanism to digest it, and derive significant nutritional gain from the process. To be considered an ‘expert grower’ of carnivorous plants, you must be able to keep your plants alive for more than a year. So, trust me, I’m an expert! When I bought my first Venus flytrap I was in the first year of university, and it didn’t last long (now I know why). Years later, when I first got to Berlin, I bought some seeds of various carnivorous plants from the shop at the Botanical Garden, but despite my best effort, nothing. Then I found a Nepenthes at the shop on the corner of my then neighborhood, Schöneberg, and it survived – it’s in front of me right now. Once you succeed, it’s easy to get carried away – if you do it, you do it seriously, so you want to collect one per type of trap (at least). You start glancing in every florist shop, just in case. In the spring and summer it’s more likely to find them in the countless florist shops – Blumenladen – of Berlin. Some of my best plants I bought in the shop inside the Kottbusser Tor metro station, and that’s almost the only positive fact about that place. Then I began ordering plants online, which is great for finding just the variety you prefer – growers offer wide selections of cultivars, hybrids selected for hybrid lovers. There are downsides though, as even with the greatest care a plant sent by mail is going to arrive at your home in a state of shock, and it can be hard for them to recover. The fragile, thin roots of species like Heliamphora are guaranteed to break as you transfer them from the wet paper it came wrapped in to a pot. If now I am the proud owner of two quite large Heliamphora, it is because I discovered the very good Garden Center near Treptower Park, where at least the plants aren’t half dead to begin with. I suspect the reason why they are so often in bad condition after a few days in the shop (and in big hardware stores the carnivorous plants section is just depressing: a monument to decomposition) is because the workers don’t know or care about the one and only thing that keeps carnivorous plants alive and happy: distilled water. Tap water contains a number of substances like calcium and fluorine that the plants are not able to process and will eventually kill them. Boiling the water is not a solution – it’s not bacteria you have to get rid of. Distilled water, like the kind your mom bought for ironing your clothes, is the solution, and there must be plenty of it as we’re talking about organisms whose natural habitats are either bogs or rainforests. Sellers don’t tell you this when you buy one – probably because most people wouldn’t buy a plant if they knew it requires a life-long supply of water you have to pay for. True carnivory has probably evolved independently at least six times in five different orders of plants for a total of some 630 species. About 300 more are considered proto-carnivorous – they don’t completely fit the criteria but are predisposed to it – and some of these are very popular as house plants, like bromeliads and Passiflora, so you can easily assemble a proto-garden of yours as well. 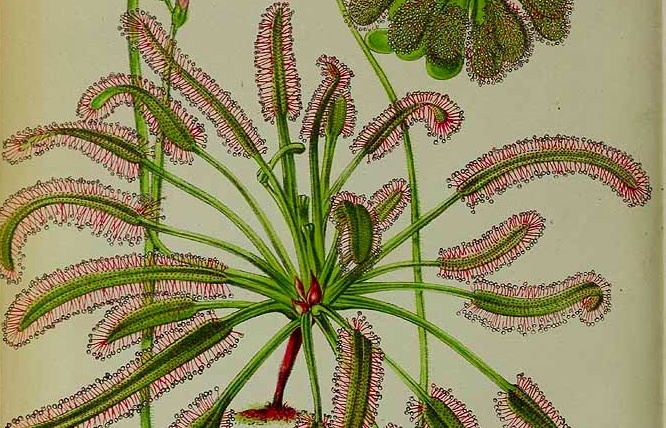 We know very little about the evolutionary history of carnivorous plants since the fossil record is very scarce and mostly made of seeds and pollen, which can be tricky. 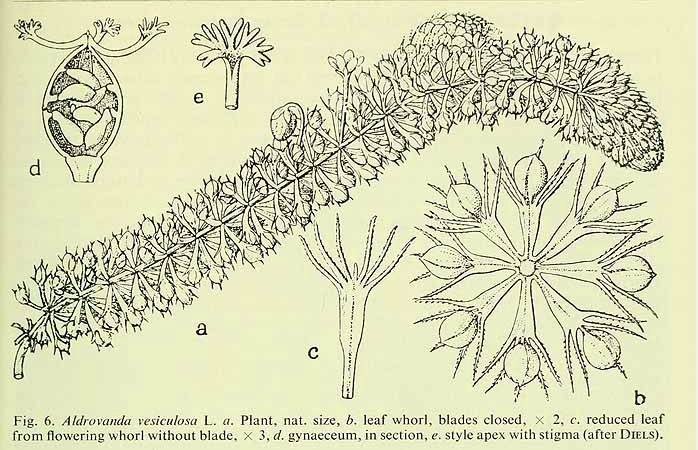 For example, the fossil pollen classified as Paleoaldrovanda splendens turned out to actually be the eggs of an insect. 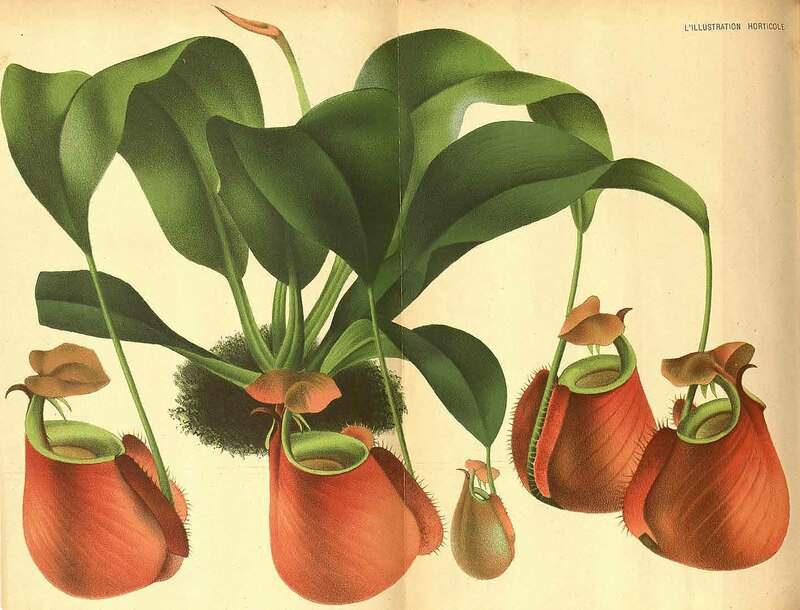 What we know is that all carnivorous plants are angiosperms, i.e. flowering plants – this means that they can’t be older than the Lower Cretaceous – and that their evolution must have proceeded parallel with that of insects, for obvious reasons. The most interesting information about the history of carnivorous species and their relationships with each other comes from genetic studies, where my degree in Film Criticism doesn’t serve me well. I can only refer you to great, interesting websites like the Carnivorous Plants Society and trust that you’ll be able to make allotetraploid hybrids out of your Drosera in no time. What I can tell you is that all of these plants came to the same solution from the same problem. In an environment where nutrients are scarce and the soil is acidic, yet there is plenty of sunlight and humidity, most of the plant’s energetic investment won’t direct towards photosynthesis, but rather towards getting the nitrogen and phosphate it needs – did I mention that in the very same sort of environment there are lots of insects around? That’s why you should never fertilize your plants; they would turn all green and forget about insects, producing leaves instead of pitchers and traps. 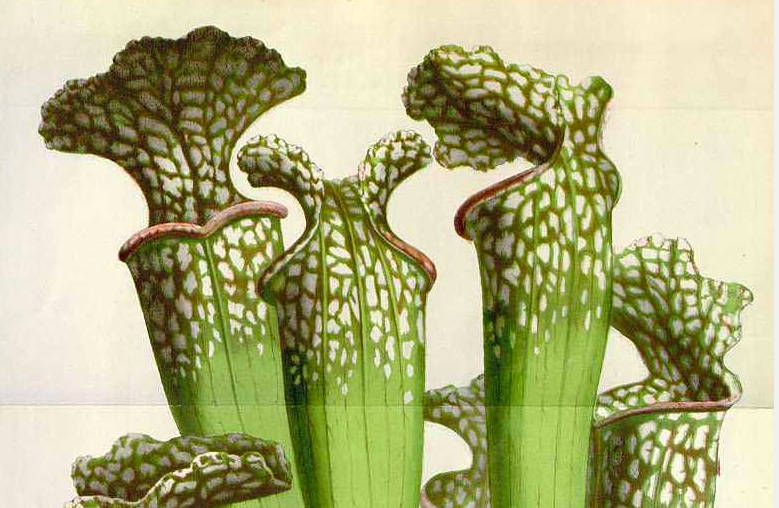 Carnivory is an adaptation they resort to in extreme circumstances (normal plants don’t do that). But we want to encourage them, don’t we? So I just feed mine some worms, and wait for the results. By the way, what will these plants eat while living in your own home? Lots of flies, spiders, little unnamed insects, moths, and so on. Not mosquitoes – those are after your blood and will not be attracted to the sweet nectary scent of our garden. Sorry about that. Just as they expect special water they demand special soil. I order it online together with Perlite – a kind of volcanic glass that comes in little white grains and helps prevent soil compaction thanks to its high permeability and low water retention. Some guides recommend a 1:1 proportion but I just put in a little bit. I use the same mix for every plant because I think they shouldn’t be spoiled; you can’t treat them too well or they will get used to it. Online you can find plenty of forums with endless discussions of sphagnum moss, peat and the like, but they will all agree that you have to find what works for you and that’s it, so that’s it. The third magic ingredient is light – the more the better, in general – though direct sunlight is best for Sarracenias, while Nepenthes prefers half-shade. The best thing is to move them around the house till you find the right spot. Insufficient sunlight will cause them to concentrate on photosynthesis because they can’t afford to waste energy on catching insects, or it will at least prevent them from developing the red coloration that plant enthusiasts like myself are after. This red color is due to the presence of anthocyanins, pigments only found in plants. They give cranberries and cabbages their purpleness, but also give flowers their colors (anthocyanins have been found in every color except green). These pigments have been proven to protect the plant’s tissues from UV exposure and the genetic damage it can provoke, so it makes sense that the Carnivory turn red in the sunlight. In some Sarracenias this might be the very reason to grow them, as pigmentation enhances the intricate design of the leaves’ veining. Anthocyanins also serve as a factor of attraction for insects that see using UV wavelengths, driving pollinators into flowers and food into mouths. Anyway, all I have is a windowsill in Berlin, and it works. A terrarium or greenhouse, maybe with automated light and humidity control, could be the ultimate amusement park for the passionate hobbyist, and could allow you to experiment with cross-pollination, hybridization and so on, but I chose not to go into that. I just try to treat my plants well and watch them closely. I want the Garden and my living space to be part of a continuum, and to put the plants under glass would betray this purpose. I want to be close to my plants – whether they like it or not. That’s what I love about the vegetable kingdom: they can’t escape, they can’t complain. So I water them, feed them, and I expect them to put up with my insistent curiosity, and cigarette smoke.